Bory de Saint-Vincent had distinguished Mélaniens from the indigenous Australians. Dumont D'Urville combined the two peoples into one group. Blond hair is rare in native populations outside of Europe, Central Asia and North Africa. It evolved independently in Melanesia,  where Melanesians of some islands (along with some indigenous Australians) are one of a few groups of non-Caucasian people who have blond hair. This has been traced to an allele of TYRP1 unique to these people, and is not the same gene that causes blond hair in Caucasians. As with blond hair that arose in Europe and parts of Asia, incidence of blondness is more common in children than in adults, with hair tending to darken as the individual matures. A Melanesian child from Vanuatu. School children from the Solomon Islands. 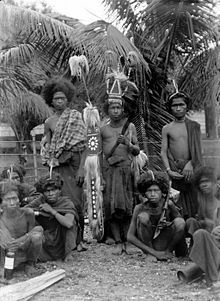 ^ "Neo-Melanesian Papuan". Joshua Project. Retrieved 25 October 2014. 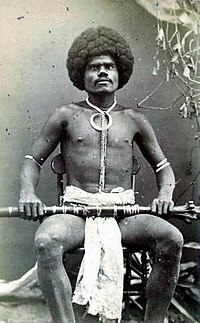 ^ "Vanuatu Melanesian". Joshua Project. Retrieved 25 October 2014. ^ a b c d e f Friedlaender J, Friedlaender FR, Reed FA, Kidd KK, Kidd JR (18 January 2008). "The Genetic Structure of Pacific Islanders". PLoS Genetics. 4 (3): e19. doi: 10.1371/journal.pgen.0040019. PMC 2211537. PMID 18208337. ^ Jinam, Timothy A.; Phipps, Maude E.; Aghakhanian, Farhang; Majumder, Partha P.; Datar, Francisco; Stoneking, Mark; Sawai, Hiromi; Nishida, Nao; Tokunaga, Katsushi; Kawamura, Shoji; Omoto, Keiichi; Saitou, Naruya (August 2017). "Discerning the Origins of the Negritos, First Sundaland People: Deep Divergence and Archaic Admixture". Genome Biology and Evolution. 9 (8): 2013–2022. doi: 10.1093/gbe/evx118. ^ a b c Carl Zimmer (22 December 2010). "Denisovans Were Neanderthals' Cousins, DNA Analysis Reveals". NYTimes.com. Retrieved 22 December 2010. ^ Kenny, Eimear E.; Timpson, Nicholas J. (4 May 2012). "Melanesian Blond Hair Is Caused by an Amino Acid Change in TYRP1". Science. 336 (6081): 554. Bibcode: 2012Sci...336..554K. doi: 10.1126/science.1217849. PMC 3481182. PMID 22556244. ^ a b Tcherkézoff, Serge (2003). "A Long and Unfortunate Voyage Toward the 'Invention' of the Melanesia/Polynesia Distinction 1595–1832". Journal of Pacific History. 38 (2): 175–196. doi: 10.1080/0022334032000120521. ^ "MAPS AND NOTES to illustrate the history of the European "invention" of the Melanesia / Polynesia distinction". Retrieved 7 March 2013. ^ Durmont D'Urville, Jules-Sébastian-César (2003). "On The Islands of the Great Ocean". Journal of Pacific History. 38 (2): 163–174. doi: 10.1080/0022334032000120512. ^ Bellwood, Peter (1985). Prehistory of the Indo-Malaysian Archipelago. Australian National University. p. 92. ISBN 978-1-921313-11-0. ^ Martin Richards. "Climate Change and Postglacial Human Dispersals in Southeast Asia". Oxford Journals. Retrieved 28 March 2017. ^ a b Kayser, M.; Brauer, S.; Weiss, G.; Underhill, P.A. ; Roewer, L.; Schiefenhövel, W.; Stoneking, M. (2000). "Melanesian origin of Polynesian Y chromosomes". Current Biology. 10 (20): 1237–1246. doi: 10.1016/s0960-9822(00)00734-x. PMID 11069104. See also correction in: Current Biology, vol. 11, no. 2, pages 141–142 (23 Jan. 2001). ^ Friedlaender, Jonathan (17 January 2008). "Genome scan shows Polynesians have little genetic relationship to Melanesians" (Press release). Temple University. ^ "Synthèse N°35 – Recensement de la population 2014" (pdf). Nouméa, Nouvelle Calédonie: Institut de la Statistique et des Études Économiques (ISEE). 26 August 2014. p. 3. Retrieved 15 June 2016. ^ "About PNG". Canberra, Australia: High Commission of the Independent State of Papua New Guinea. Retrieved 15 June 2016. ^ "Estimates of Aboriginal and Torres Strait Islander Australians, June 2011". Australian Bureau of Statistics. Belconnen, ACT. 30 August 2014. Retrieved 15 June 2016.